“A party without cake is just a meeting” ― Julia Child. Tarte Tatin - a type of upside-down apple tart consisting of pastry baked over slices of fruit arranged in caramelised sugar, served fruit side up after cooking. Every cook should go to a cooking class at least once a year. Besides being inspiring it’s a day spent with cooks who are passionate, about their homes, families, friends and what’s cooking. They’re eager to learn and most often than not the person giving the class has spent hours fine tuning a menu to suit most palates. I always walk away from a class rejuvenated, excited and motivated to get cracking on new delicious food ideas. Yesterday’s simple, tasty and colourful menu reminded me to look up old favourites, jazz them up, plate them differently and serve honest food cooked from the heart that won’t intimidate. The secret to the success of any meal is the planning, prepping and time management of the menu. Success follows passion. For a mouthwatering treat watch Babettes Feast, just thinking about this divine movie gives my heart a lurch so we'll be feasting on Babette tonight if my Precious can manage another 90 minutes with women in a kitchen, he's been Master Cheffing it with a Mystery box at the High School in lieu of a staff party, I can't wait to hear which team won. At this time of the year I think of sundrenched red Adam’s figs, goats cheese, walnuts, honey, grapes and Rosemary. Oh, make haste it’s time to soak up the sun, lay a table outside, use the red check table cloth, mix and match wine glasses and feast on nature’s abundance with abandon. Wake up an hour earlier and while the house pauses before a new day, start preparing one of these delicious upside down concoctions. The perfect dish for an Alfresco luncheon served as a starter, main or accompaniment. Served warm or at room temperature, it remains one of my favourite dishes for summer. Get your act together and prepare in advance, pre-cooked the tart may be kept refrigerated and baked later. Serve a sweet option using the fabulous summer fruits so readily available now eg. apricots, peaches, figs, apples and the last of the pears. Take Grandmama's platter off the wall, give it a good wash and turn your tart out onto an heirloom, who knows someone may even notice it again, serve thick clotted cream from an ancient veined bowl. Breath new life into memories. This is an upside-down apple tart on a pastry base. 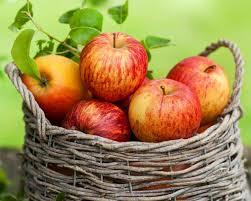 Fresh or tinned apricots or pineapple can be used in place of apples. 1. Melt the butter and brush the the inside of a shallow cake tin. 2. Line the base with baking paper and brush with melted butter. 3. Sprinkle the brown sugar evenly over the paper and press down. 4. Peel, core and thinly slice the apples. Arrange the slices in circles over the brown sugar. 6. Bake in the centre of the oven pre-heated to 180°C for 35-40 minutes or until crisp and golden brown. 7. Cool the tart for about 5 minutes, then turn out, upside down, on a serving plate. Remove the paper. Serve the tart hot, with delicious thick cream or custard. 1. Sprinkle nuts like walnuts, almonds, chopped into chunky pieces over the apples. 3. Sprinkle with a few whole cloves and ground cinnamon. 4. Lemon rind adds a twist; in fact any citrus rind will add delicious flavour. 5. A quick drizzle of honey goes so well with apples, add a dash to the cream or a drizzle once the tart has been plated. 6. Sprinkle with a tot of brandy and flambé before covering with the pastry blanket. 7. The sugar can be caramelised on the hob in a thick-bottomed cast iron pan and then the fruit may be added and when cooled covered by the pastry blanket. Cut a little larger and folded in to reserve juices and baked in the oven as directed. Just adjust the baking time as the fruit will be half cooked. 8. Substitute fruit with figs and walnuts and just before serving add crumbed blue veined cheese or Goats’ Cheese and rocket on a platter with prosciutto as a starter. Drizzle with a Balsamic reduction. Serve this dish with a good red wine. Cheers! My favourite al Fresco dish served with an ice cold Sauvignon Blanc. Perfect for the Buffet table. Simplify work by doing steps in stages. Use a selection of tomatoes now available and garnish with tomatoes on the vine which can be oven baked while the tart is baking. Drizzle olive oil over the vine, add a few sprigs of Marjoram and bake, the Marjoram also adds flavour so do not discard. 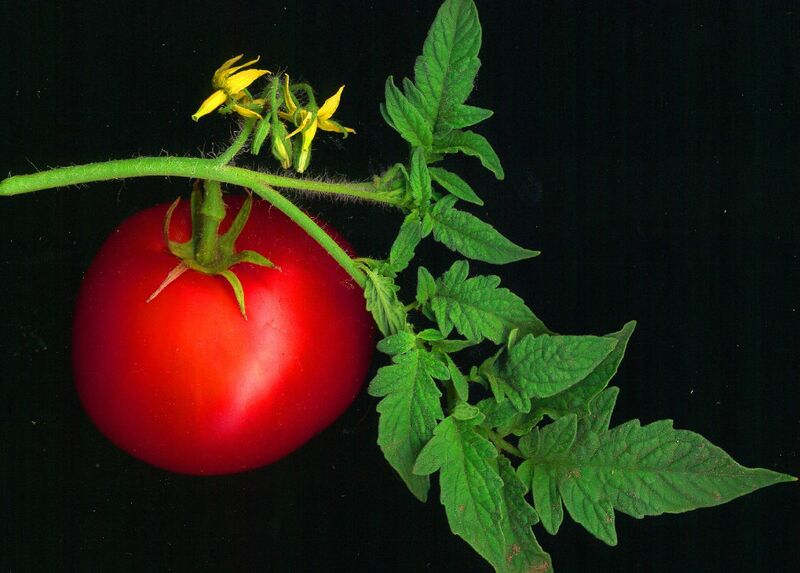 6-8 ripe red tomatoes, if large cut into squares or halve or use Roma tomatoes as is. 1. Pre-heat the oven to 220°C. Toss the tomatoes in the olive oil and soft brown sugar, salt and pepper. Arrange skin-side down on a baking tray lined with baking paper. 2. Toss the peppers in a little more olive oil, salt and pepper. 3. Roast for 35-40 minutes, until nicely browned. 6. Sauté the onions in the butter or olive oil, then turn the heat down. Cover the onions with greaseproof paper and a lid. Simmer for 20-25 minutes until the onions are soft and mushy. Check seasoning. Leave to cool. 7. In a heavy-based saucepan melt and caramelise the sugar using a high heat. Shake the pan continuously – do not be tempted to stir! 8. Carefully add 15ml water to thin the sauce a little. 9. Pour the caramel sauce into an ovenproof quiche pan. Tilt the pan to coat the bottom and a little way up the sides. 10. Arrange the cooked tomatoes (skin side down) and then the peppers to cover the base of the dish in a pretty pattern. Spoon the onions over the top and smooth. Cool down. 11. Cover the top of the pan with the pastry, tucking the blanket down into the pan to reserve the liquids when turning out. The tart may now be refrigerated and used later. 12. Bake at 200°C for 25-30 minutes until the pastry is crisp and golden brown. The oiled vine tomatoes and marjoram on a separate baking sheet may be placed into the oven now too. 14. Turn out onto a large round pretty plate (blue and white goes beautifully with the red tomatoes). To turn out: cover the tart with the plate, turn over quickly so that you invert the pie onto the plate. 15. Garnish with the herbs and the baked tomatoes on a vine. 1. Crumbled Feta cheese may be sprinkled over the tart when serving. 2. Torn Basil leaves add a delicious flavour. 3. A drizzle of Balsamic reduction just before serving will do the trick too. Tomatoes paired with marinated mushrooms, green and black olives with a sprig of Rosemary, some capers and garlic cloves, fresh strawberries or prosciutto, Mozzarella cheese or Gorgonzola are all essentially Italian. 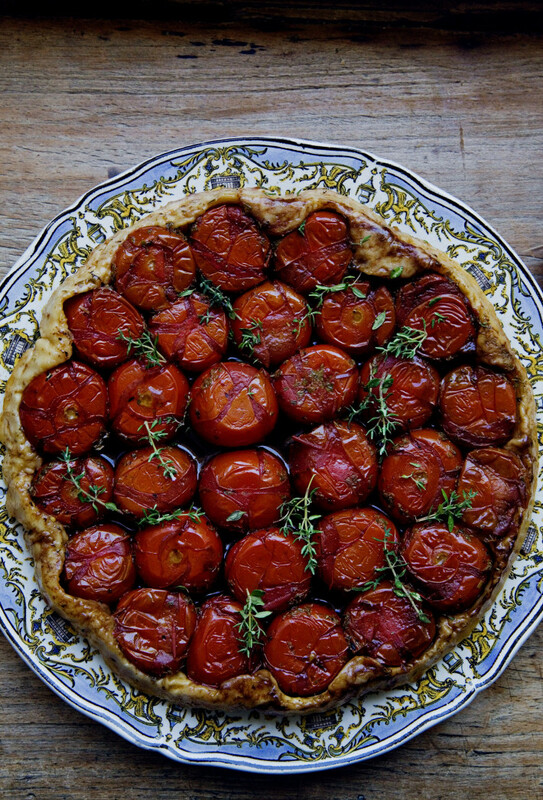 Serve in pretty bowls on a large wooden board with the Upside down Tomato Tarte Tatin as a summer starter or antipasti. 3 cloves of garlic finely sliced and added to the onion rings. Cool down completely before using. 1. Pre-heat the oven to 180°C. Halve the tomatoes and place them skin-side down on a baking tray. Scatter the oregano or marjoram sprigs over the tomatoes. Drizzle over some olive oil and sprinkle with salt and pepper. Place in the oven for 15 minutes. 2. Boil the potatoes in their jackets in salted water for 25 minutes. Drain and let cool. Cut into 1cm thick slices. 3. Liberally brush a baking tray with oil, making sure to include the edges and corners. Lay the potato slices close together on the bottom of the baking tray. Add the caramelised onions and garlic if you’re using them. 4. Arrange the tomatoes and olives into the gaps and sprinkle with salt and pepper. 5. Place the rolled puff pastry over the tart filling and gently tuck the edges down around the potatoes inside the pan. Tart may refrigerate now and used later, keeps for 1 day. 6. Pre-heat the oven to 200°C. Bake the tart for 35 minutes or until the pastry is cooked. Remove from the oven. Rest for 5 minutes until the pan is manageable. Hold an inverted serving platter firmly on top of the baking tray and carefully and briskly turn them over simultaneously. 7. Garnish with the crumbled Feta Cheese and Basil leaves. 8. A Gorgonzola crumbed will add glamour with its divine taste. 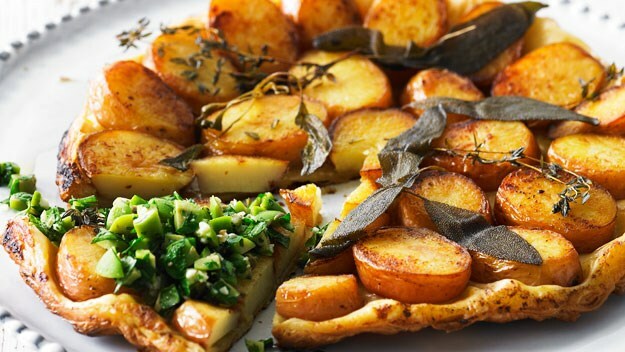 Serve this dish with Rosemary which really spruces up any potato dish. Pair Rosemary with grapes, goat’s cheese and chocolate served on a platter with rustic Rosemary biscuits after a main course. “As for Rosemary, I let it run all over my garden walls, not only because my bees love it, but because it is the herb sacred to remembrance and to friendship.” Sir Thomas More, British writer and statesman. Today we think of our dear friend who won’t be here to celebrate his birthday, he leaves a hole in our hearts, how I wish he’d just shuffle past our house one more time! I’ll add a tot of Johnny to my whipped cream and honey and toast you! 1. Heat a heavy bottomed frying pan, add granulated sugar, whilst shaking the pan melt the sugar over a low heat until it turns a golden colour. 3. 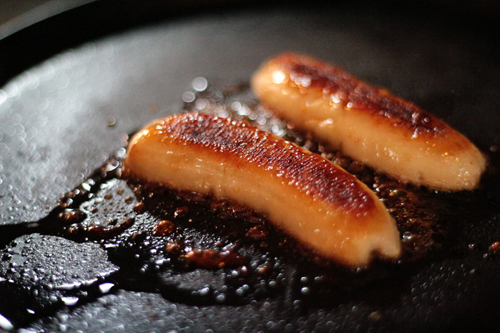 Add the bananas, turn up the heat slightly and brown slightly on both sides. 5. Add the brandy, heat and light, flambé until the flame dies down. 6. Turn the heat off, cool down completely. 7. Roll the puff pastry on a floured board or clean counter top until the size is 2 inches larger than the pan. 8. Cover the fruit with the pastry blanket tucking it in all around the pan to reserve the juices. The tart may be refrigerated until needed, for a few hours. 9. Bake in the pre-heated oven for 20-25minutes until the pastry is beautifully golden brown and crispy. Coffee compliments bananas extremely well. To ring the changes use a coffee flavoured ice-cream. 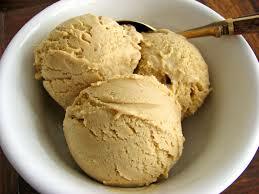 To make a coffee ice cream use a slightly frozen shot of espresso (or ¼ cup strong cold coffee) add 2 tots of coffee Liqueur fold into the slightly defrosted Vanilla ice cream, refreeze. T.S Elliot said “I have measured out my life with coffee spoons”.